Easter “Egg” Hunt: Choose vet-approved toys that you can hide treats in (such as a Kong or other similar type toy) and substitute the toy in the place of the traditional plastic egg. (Plastic eggs should not be used in the Easter egg hunt for your dog as they can chew it up, swallow plastic or cause a possible choking hazard.) Take the Kong or similar toy, add your dog’s favorite, strong-smelling treats to each egg. Allow your dog to watch what you are doing. With your dog out of sight, hide those toys! Consider your dog’s level of experience with nose work when choosing hiding spots. If your dog is new, keep the toys at nose level where they can be seen fairly easily. Lead your dog to the first hidden treat. After the third or fourth toy, he may start to understand the game and begin searching for them on his own. If not, that’s okay too. You may have to lead him to each treat you’ve hidden but you’ll be sharing a fun and bonding experience together and he’ll have fun simply being with you! When discovering a hidden treat, many dogs will pull the treat out and enjoy it, but you might need to provide some assistance. Lastly, don’t forget to have a camera handy to capture what are sure to be some adorable and humorous moments! Try adding an “Easter egg hunt” just for your canine companions this year to include them in the celebration. Easter Family Portrait: Its a tradition for many families to take a family portrait while they are dressed in their Sunday finest. Some families include grandparents, aunts, uncles, and cousins into the timeless memory, so why not include your Frenchie? What are some tips for taking a family portrait with your furry friend? Your biggest challenge is capturing a shot with all the movement, so turn your camera on the Sports Shot mode to freeze those few seconds of time when your Frenchies are still. 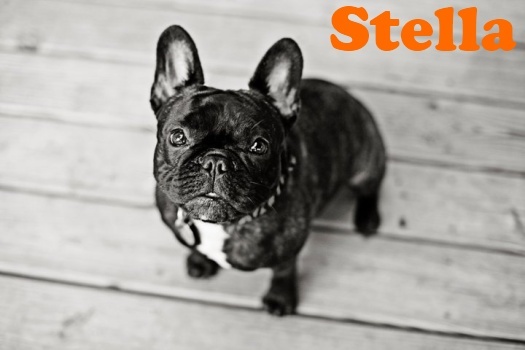 If your dog is trained, use the ‘down’ and ‘stay’ commands to get the dog to stay in one spot. Position the family around the dog in a semi-circle facing the camera. Tallest child should be in back and shortest children closest to the camera. But even if its not perfect, those candid shots sometimes turn out much better than any posed shot ever could. 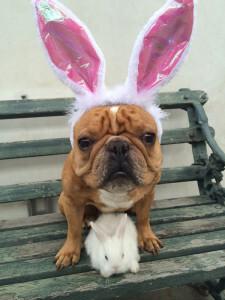 Easter Dinner: We slave over our holiday family meals with a baked ham, roast turkey, all the fixings, pies, desserts and punches, but it would be a special treat during the holidays to make an Easter meal for our Frenchies. Find a great recipe online including Pumpkin Biscuits, Sensational Salmon Cakes, Mighty Muffin Meatloaves, Sweet Pooch Pancakes and more. [Find some great recipes at Rachael Ray’s magazine.] Always check with your vet about which foods are appropriate for you to share with your pet. Easter Costumes: This is also the time of the year we buy new dresses, suits and all the accessories in bright Spring colors and patterns for ourselves and our family. 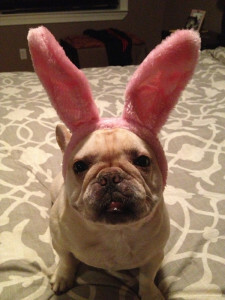 Nothing is cuter than your furry friend dressed up in Easter themed apparel. I’m sure we enjoy it more than they do, but most pets will humor us for at least a while! 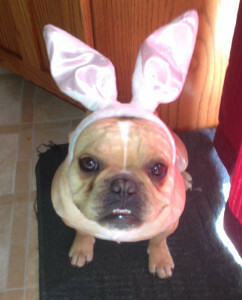 We’ve attached some photos from our Frenchie Families with Easter-inspired costumes and accessories. By dressing up our pups, our Frenchies can add to the celebration and flair of the holiday.